The winners will be announced on December 3rd 2018. Voting ends December 2nd, 2018. Marmalade won the hearts of the public! But the real win for these furry friends is to find them a house they can call home, and humans they can call a family. Voting is now closed – Congratulations to our winner Marmalade! Life tried to make Sheena an “underdog”, but she said NO! Sheena was surviving sick and alone on the streets when she was found by one of our volunteers in 2015 and taken to a local shelter’s street cat clinic to be spayed. While getting ready for surgery, she stopped breathing. Immediate euthanasia was recommended, but we chose to resuscitate her instead, and then rushed her to our own vet for hospitalization. Sheena was suffering from skin, eye, respiratory, and intestinal infections, plus tests revealed that she had the Feline Leukemia Virus (FeLV). Sheena was given an estimated 6 months to live, but this determined girl cheated death yet again. This sweet lap cat just needs her forever home! Sheena’s will to live is so unstoppable that she is our first cat ever to be re-classified from Palliative status to Adoptable! 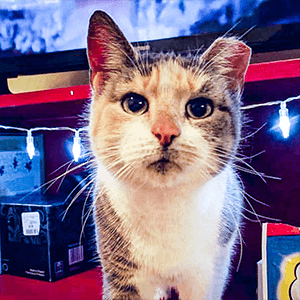 Even though she has FeLV, which will eventually be fatal, this sweet and cuddly former street cat deserves a forever lap to curl up on until that time comes – which is hopefully many years away! Even though Sheena is currently on medication due to her FeLV, she is easy to care for and has been as healthy as possible for the past 6 months since her spay and dental surgeries. She would be a great addition to a patient, quiet family where she can be appreciated for how great of a lap cat she is! Sheena would be happy as a single kitty or would likely enjoy the company of another calm FeLV kitty friend. My 3 legs are twice as cute! “My name is Nermal. I am a very affectionate young kitten born in April 2018 and brought to a kill-pound with my family. We were saved and I ended up with Moustache Adoptions. I had one of my hind legs amputated because of an injury. It is unknown what happened exactly. I was rescued in that condition. So now I’m an adorable tripod! I suffer from cerebellar ataxia and that affects the coordination of my lower limbs. It does not make me sad or prevent me from getting around however! I’m a very happy, very sweet and affectionate kitty. I have a lot of love to give and I need someone who wants to give me a great life despite my disability. I try as best as I can to use my litter box but sometimes I have small accidents. I like to play in a playpen with toys and blankets which sometimes I accidentally soil… as much as I try not to. I can’t always control it. I wasn’t able to use my litterbox properly originally with my bad leg but now I’m learning how to do that just like a big boy kitty. I’m not incontinent – nope! – I just need some training and I’m getting better with that every day! I love pâté – guess why! Mickey Mouse is a very sweet and endearing senior who came to our shelter after his owner passed away. Shelter life is hard enough for any cat but it’s especially difficult for seniors when they’ve lived with their person their whole life and suddenly find themselves at a shelter, alone without their special person and no understanding of “why”. 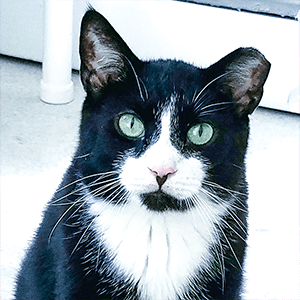 Mickey Mouse has a history of a broken jaw from a home invasion, so he can only eat wet food. Being a senior and having his medical special needs has made people overlook him time and time again. He has been at our shelter for 1.5 years now. Mickey Mouse doesn’t like to be alone, so this also makes people look past him to other cats. Mickey Mouse is an incredibly sweet old man who just wants a retirement home with lots of love. Somewhere he can sleep in a sunbeam or watch the birds out the window. And in return, he’ll reward you with quiet companionship and endless love and purrs to show his gratitude for the rest of his golden years. At 11 years young, hopefully those golden years will last for quite a few years yet. “My name is Mickey (Mouse). I’m a reserved chill gentleman of “slightly” older years. I like my people close but not clingy. Hanging out watching Netflix after a warm tuna snack is my jam. I enjoy supervising desk activity and will sleep beside the monitor while you work. I’m pretty much Mr. Zen looking for a calm home. Whitman is like the nerdy boy in high school who’s a nice guy but always seems to be overlooked. He likes to hang out with all the ladies and you’ll often find him snuggled in a cat bed with one of his roommates (he’s the only male cat in a room full of female cats). He’s never bonded though with any cat that has spent time in his room at the shelter. He’s a shy kitty who is hesitant with strangers which is his biggest hurdle to adoption. When visitors come to the shelter, Whitman will hide or watch them from a corner or just out of reach but will not approach for pets. He is very playful and a little goofy but mostly with volunteers he knows – so we know there’s a more confident kitty inside him, just dying to get out. He has been at the shelter for 8 years now and has always been very skittish and shy. A few of us volunteers have been clicker training him as part of our Cat Pawsitive training program. Since we started training Whitman his confidence has grown in leaps and bounds! He is engaged and focused during his sessions and is learning so much. He makes eye contact for his name, sits, gives high fives and even goes up on two feet on cue. Whitman is coming closer and closer to people and even letting some pet him. We are so proud of all he has overcome. We really believe he would thrive in a forever home with someone who will be patient and spend time with him. Marmalade is a fun, friendly boy who lost the tips of his ears to frostbite before coming to the shelter. He’s also FIV+ and a little over-enthusiastic when he gets wound up, so he can be a bit mouthy. 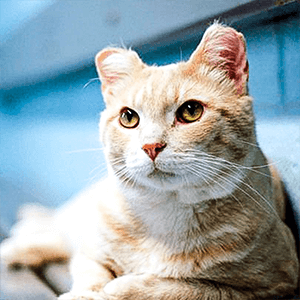 FIV is Feline Immunodeficiency Virus – this just means he has a compromised immune system. Between Marmelade’s FIV, his scrappy looks, and very intense personality, potential adopters pass him over and look for a more mellow cat. We suspect he’s bored in his cage and at only 2 years old, who wouldn’t be? If this young boy had his own house to run around in, to burn off some of his energy, he’d be much calmer and less aggressively playful. Marmelade doesn’t mean to hurt, he just gets carried away playing. Despite Marmelade’s adorable looks and cheeky glint in his eyes, some people may think Marmelade is ‘unadoptable’ due to his FIV. But they couldn’t be further from the truth! 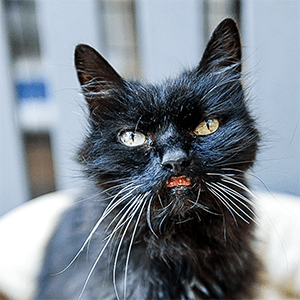 FIV is not a big deal (it can’t be passed to people or other animal species) – given proper care and attention, an FIV+ cat will live the same lifespan as an FIV negative cat. We hope someone will fall in love with Marmelade, give him the chance he deserves and spoil him a bit. He was rescued from the streets by some kind people who brought him to us and, while his past may have been difficult, Marmelade hasn’t let it get him down. He’d be happiest in a home without very young children, and we think he might be ok with a dog. Are you worthy of me Hooman? A bit grouchy and past her prime, Bellatrix is still everything you could ever want in a cat if you like a bit of sass and don’t scare easily! Bellatrix came to us from a city shelter, and boy! was she serious about her grump until we got her shaved down. Severely matted, all those knots were pulling her skin, and hell’s bells, that would make anyone cranky. Now she’s mostly faking it. This girl gets vocal when asked to do things she does not like, for example, being put into her enclosure at night, or getting fluids – she growls like she “really means it this time!” but then eats the food we distract her with, so it’s all good. Bellatrix can also be very affectionate and enjoys sitting in laps. (Oh yea, asking her to move off your lap before she’s done with you can also make her a little grumpy, but if you quickly place her on a fluffy bed that she can disdainfully reject, because that was NOT what she was looking for, it works out). Bellatrix is very self-possessed, and she can own any look. Another cat may have been mortified with the patchy lion cut she got, but Bellatrix owned it and strutted around like she was saying, “You ALL wish you were THIS damn good looking!”. Bellatrix likes to gaze off into space and look thoughtful. We’re not sure what she is thinking, but they are very, very deep thoughts. Bellatrix deserves a home! We are no longer afraid of her and one day you won’t be either. George Yoda is an outgoing, fun loving, silly, 10-year-old cat. This handsome orange boy just lives to be held, petted, brushed, and doted on by people. 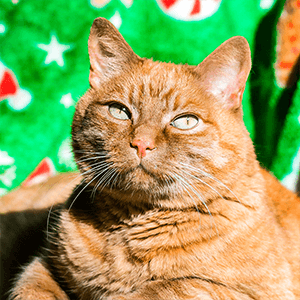 George came to Purrfect Pals 6 yrs ago because he’d stopped using the litter box. He had been declawed, and like many declawed cats, he seemed to find litter boxes less than attractive because stepping on the litter was painful on his now sensitive feet. 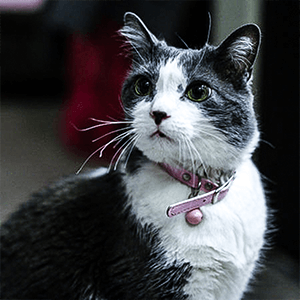 We also discovered he had a tendency to develop urinary crystals – when it’s painful to pee, this can also be a big reason for not wanting to use the litter box. Mr. Yoda is now on a prescription diet, but unfortunately, old habits can be hard to break, and George doesn’t always think inside the box. Unless a very special person comes for him, George Yoda will probably spend the rest of his life at the shelter, without the comforts of a home or his own special people to love and spoil him. That’s a high price to pay for an unnecessary declawing surgery to keep someone’s furniture perfect, or unsupervised child unscratched. 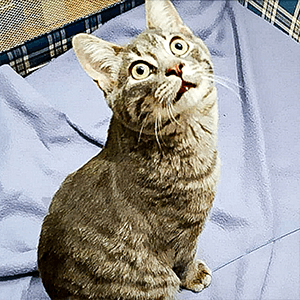 George urges everyone to re-think declawing and consider how different his life could have been if his original owner had put George’s welfare first. We still hope George will find a family who is understanding and willing to try some different litter box techniques in exchange for the joy of being loved by this wonderful snuggle-bug. He’s great with children and other cats! I’m FOUR times as special! FIV + FeLV + black + shy = pretty darn special! 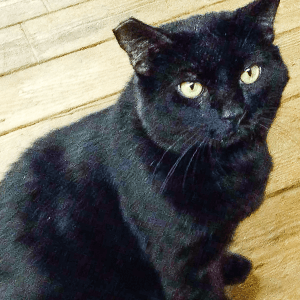 Cole is a big, shy and very handsome black cat…which makes adoption hard anyway, but Cole is extra special because he is also a double positive – Feline Leukemia (FeLV) and Feline Immunodeficiency Virus (FIV) positive. While he shows no current signs of either virus, finding him a home has been very, very difficult and he is still waiting for his forever family. Cole is a super polite, super sweet cat. He is like a big fluffy teddy bear! He drools when people pet him and asks to be petted more! Cole will LOVE his forever family once they find him. He just needs a quiet, patient home filled with the love he deserves so he can fully blossom into the loving kitty he shows signs of being – some wet food bribery will help too! Do this and you will win this BIG boy over BIG time. Cole would enjoy being a single kitty or having another FeLV kitty as a friend. Don’t be scared off by Cole’s FeLV and FIV diagnoses – at 8 years young he can still have many, many wonderful years ahead of him! His extra special status deserves an extra special family that will love on him every day. We know that special family is out there for this awesome boy – could it be you? If for any reason the Contest is not capable of running as planned or if the administration, security, fairness, integrity, or proper conduct of this Contest is corrupted or adversely affected by reason of infection of computer virus, bugs, tampering, unauthorized intervention, fraud, technical failure, or any other cause beyond its control, Petcurean reserves the right to cancel, terminate, modify or suspend the Contest, including cancelling any method of entry. Petcurean may at its sole discretion amend the Contest Conditions at any time. Decisions of Petcurean are final. Petcurean is not responsible for lost, misdirected, misplaced, incomplete, illegible or damaged entries, garbled or delayed computer transmissions, or entries submitted after the contest deadline. Petcurean is not responsible for telephone, technical, network, online, electronic, computer hardware or software failures, or congestion on the corporate website, of any kind. No cash or other substitution or transfer of the Prize is permitted, except that Petcurean reserves the right, in its sole discretion, to substitute a Prize of equal or greater value. All costs and expenses not specifically included above as part of any Prize, including, without limitation, any applicable taxes, are the sole responsibility of the winner. All food prizes will be delivered in the form of actual Petcurean food, shipped to the winner/finalists. There is no cash equivalent to any prize. All prizes must be accepted as awarded. Petcurean shall not be liable to the Winning Entrant nor to any other person for loss or damage to person, property, or computer resulting from or connected with participation in this contest, downloading any materials relating to this contest, or acts or omissions of Petcurean and/or the prize supplier. Neither Petcurean nor its officers, directors, employees, agents, successors, or assigns shall be liable for any warranty, costs, damage, injury, or any other claims incurred as a result of the usage of a prize by any winner. Petcurean is not liable for any loss arising out of or in connection with any contest promoted by Petcurean. Petcurean, its authorized agents and/or representatives may collect, use, and disclose the personal information provided by each entrant at the time they enter the Contest for the purposes of administering the Contest, contacting potential winners and as otherwise permitted or required by law. By entering this Contest, each entrant expressly consents to the use of his/her personal information for such purposes. By accepting the Prize, each winner hereby further consents to Petcurean’s use, as determined in Petcurean’s sole discretion, of the winning dog’s name, shelter/rescue residing at, city of residence, picture, biographical information, statements, and likeness for advertising and other promotional purposes, in any media or format, whether now known or hereafter developed, including but not limited to the Internet, at any time in perpetuity and worldwide, without further compensation or notice to any such winner. Petcurean reserves the right, at its sole discretion, to disqualify any entrant from the Contest if Petcurean finds or reasonably believes such individual to be tampering with the entry process or the operation of the Contest and/or to be acting: (i) in violation of these Rules; (ii) in an unsportsmanlike or disruptive manner; or (iii) with the intent to annoy, abuse, threaten or harass anyone, including Petcurean and its employees. Any attempt by an entrant or other individual to automate the entry process or otherwise undermine the legitimate administration, security or operation of the Contest may be a violation of criminal and/or civil laws. Petcurean reserves the right to seek remedies and damages from any such person to the fullest extent permitted by law. Entrants engaging in any of the foregoing activities may be disqualified and forfeit any Prizes won. If the winner does not respond to the notification within fifteen (15) business days, the Finalist with the next highest number of votes will be deemed the winner. Failure to respond within the time frame listed above shall mean that the provisional winner forfeits the prize. By submitting Materials to Petcurean, Entrants represent and warrant that the Materials do not infringe any copyright, trademark, property rights, rights of privacy or publicity of any person, or any other right of any third party and that Entrant have the full and unrestricted right to transfer the Materials to Petcurean free and clear of any claims or encumbrances. Entrants acknowledge and agree that Petcurean shall have no obligation to post, display, or otherwise make publicly available any Materials submitted by Entrant. All persons nominating a dog must be at least 18 years of age, unless otherwise stated or posted. Petcurean has the right to publish the name and location of the winner without remuneration. A qualified nominating entrant (Entrant) is someone who is a Canadian or US resident aged 18 years or over. Employees of Petcurean, its subsidiaries and affiliates, as well as family and household members of same who reside at the same address are not eligible. Entrant and Entry must meet all Contest Conditions as outlined below. Entry and/or Entrant not meeting Contest Conditions will be disqualified and prize will be forfeited. The Contest Period runs from when the website, Facebook and Instagram contest posts are released to the public until 6:00 pm on May 6, or on such other date and time as posted by Petcurean. To enter and be eligible to win, the Entrant must complete the entry form at Petcurean.com/UpliftTheUnderdog or UpliftTheUnderdog.com. An Entrant may enter the contest and nominate up to 3 dogs maximum during the nomination period. An Entrant can only win one prize. All entries will be collected during the Contest Nomination Period. Entries will be reviewed and 18 finalists (6 per cateogry) will be chosen by Petcurean. The public will then vote for their favourite finalist for each of the 3 categories who will be deemed the winner. Information collected online will be stored in a secure database only accessible by Petcurean. This information will not be sold to or copied for any other 3rd party. Odds of winning will depend on the number of eligible entries received before the contest deadline. Winner will be contacted as soon as possible after the draw by Petcurean through email. Winner must provide delivery address for the prize within 15 days of notification, after which prize is forfeited and becomes the property of Petcurean. There is no cash equivalent to any prize. All prizes must be accepted as awarded. Any intent by the Entrant to misrepresent themselves through the use of aliases and e-mail addresses will be disqualified. In the event of a dispute regarding the identity of the person submitting an electronic entry, the entry will be deemed submitted by the person whose name appears in the database. If an Entrant is found to be ineligible, an alternate winner will be selected from the pool of all eligible entries received. Your personal information is collected and used by Petcurean in accordance with British Columbia’s Freedom of Information and Protection of Privacy Act. It will be used only to administer this contest. Your information will not be sold, shared with third parties, or used for soliciting purposes.